Study reveals polar bears have Irish maternal ancestors | UNBELIEVABLE! Where do Polar Bears come from? The obvious answer is, of course, the North Pole. However, if we go far back enough generations, the real answer is theRepublic of Ireland. The furry white giants are in fact descended from now-extinct Irish brown bears that lived during the last Ice Age. This surprising finding is the result of a study of ancient brown bear teeth and skeletons found in various cave sites across Ireland. Scientists from the UK, Ireland and the US analysed the brown bears’ mitochondrial DNA – which is passed from mother to child – and it turns out they share a distinct DNA sequence with all of today’s polar bears. It was a changing climate that caused their paths to cross. 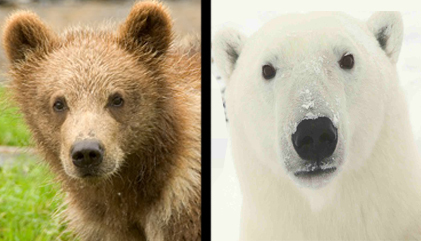 Just before – or during – the last Ice Age, the two species came together and polar bears mated with female Irish brown bears. “The hybridisation between the two species occurred at a time when their home ranges overlapped, most likely during environmental stress”, explained Dr. Edwards. Posted on August 20, 2011, in Biology, Ecology and tagged bears, brown bears, interbreeding, ireland, mitochondria, polar bears. Bookmark the permalink. Leave a comment.